The combined efforts, in 1965, of the Talisman Lodge, Knights of Pythias, Upper Applegate Grange, and the Jackson County Court restored the roof, thereby keeping the aging structure open for pedestrian use. 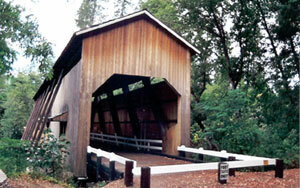 Little upkeep followed, and by the early 1980s County officials were worried about the strength of the bridge. During the summer of 1985, more than $40,000 in labor and materials were dedicated to repair the bridge and keep it open for pedestrians. Jackson County officials then announced that future County investment in the bridge would be impractical, and has looked to private efforts for ongoing preservation of the McKee span. The McKee Committee was formed in January 1989 with the goal of raising $25,000 for preservation and maintenance of the span. By mid summer, a major portion of the funds, or volunteer labor, had been generated. Included in the final fund-raising was the sale of memorabilia and the production of an historic quilt featuring a bridge motif. Features of the Mckee Bridge include a Howe truss design, flying buttresses, open daylighting windows at the roofline, and a shingle roof. Lindsay Applegate, for whom the stream is named, prospected the area on the way to the mines in California. The discovery of prosperous mines caused a north-south route to be developed in the area, and the covered bridge was used as a rest stop, until 1919, because it was halfway between Jacksonville and the Blue Ledge Cooper Mine to the south. The McKee Picnic Ground, a Rogue National Forest facility, is at the west end of the bridge along the Applegate River.